It’s interesting, to me at least, that an album that has gone on to provide much of the core concert repertoire of a band still going strong forty-plus years later should have peaked at #188 on the Billboard charts first time around. It is, I think, another of those records that didn’t sell a lot, at first, but everyone who bought it either went on to do something or placed a big tick beside a name to watch out for. Maybe not quite everyone, but Black Hearted Woman had wormed its way into the set list of a Cairns-based heavy rock quartet called Barabbas by December 1970, and I suspect there was a desire to emulate the Allmans’ sound that had the outfit looking for someone who could replicate Gregg Allman’s Hammond B-3 licks and add a bit of light and shade to a very classy guitar, bass and drums trio. And, quite seriously, it’s hard not to be impressed with an album that may or may not be the best debut album ever delivered by an American blues band, but definitely laid the groundwork for a whole genre of powerful, hard-edged blues-based Southern rock. 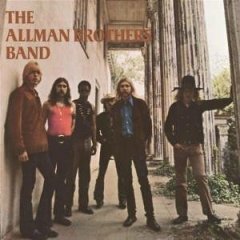 The Allmans went on, thanks largely to the band’s legendary live performances and the live At Fillmore East album, to become huge, but it was success based on a core repertoire and much of that core repertoire comes from right here. Working the genre in a concert environment you could possibly find a better way to start (Statesboro Blues?) than the opening one-two punch of Don't Want You No More > It's Not My Cross to Bear but they’d be relatively few and rather far between. The loose jazzy instrumental they acquired from the Spencer Davis Group’s 1968 post-Stevie Winwood album With Their New Face On, just in case you’re interested) works pretty well as a snappy limbering up exercise with Duane Allman and Dickey Betts’ guitars and Gregg Allman's organ surge along over Berry Oakley's bass and the drums duo of Butch Trucks and Jaimoe propel things into a shuddering climax and Duane and Dickey play the harmonised guitar line that runs down into It's Not My Cross to Bear. That instrumental intro hints that, hey, we’re not looking at a straight blues band here, but Not My Cross points out rather succinctly that here’s an outfit that can damn well play the blues straight if straight is what you’re looking for with clear, ringing guitar licks, a mighty fine vocal and a wrenching Duane Allman solo. Then there’s Black Hearted Woman, faster with stinging interplay between Duane and Dickey Betts and the vocal and guitar bit towards the end that harkens right back to the moans and hollers on the plantations, work camps and prison farms (leastways that’s how it sounds to me). Gregg comes across vocally as a grizzled old blues man rather than a skinny long hair in his early twenties and consolidates the impression on Muddy Waters’ Trouble No More, where Duane's distinctive slide work with the coricidin bottle shoots into the spotlight for the first time. If you were going to identify a weak link in an otherwise impressive collection you might go for the rather formulaic Every Hungry Woman, though it still chugs along merrily enough with sufficient opportunities for guitar pyrotechnics to hold down a regular place in the band’s set lists some forty-three years after the album appeared. If (and it’s a dubious proposition, but I have heard and seen it expressed) EHW is the album’s low point, weak link or whatever, that just underlines just how fine everything else is. Or maybe you come to that conclusion because it precedes the album’s two set piece showcases. First there’s Dreams close to seven and a half minutes of organ-drenched atmospheric waltz-time dynamics that combines world weary brooding (I’m hung up/On dreams I’ve never seen), an understated vocal and easy-rolling elements of blues, jazz, and psychedelic rock with a lyrical solo from Duane that climbs higher and higher until the bottleneck comes out and really nails things. For mine, the album’s definite high point. Given a little more time, however, that tag could well have been afforded to the surging, rolling and tumbling Whipping Post, though 5:19 probably isn’t long enough for things to really build the way they were soon to do in the live setting, where the track regularly clocked in around the fifteen minute mark. Still, from the start of that completely distinctive Berry Oakley bass line, the tension builds over the driving drum combo as the guitars wail and the whole thing comes to a shattering halt, making it a cathartic concert closer, and the ideal way to wrap up a very solid debut. With the potential to be spun out to a much lengthier extrapolation in the live setting, Whipping Post, like the rest of the album is a sign of things to come, and while greatness mightn’t have been achieved here (they hadn’t hooked up with Tom Dowd yet) and hadn’t quite arrived with Idlewild South either you could, I think, sense it just over the horizon.